These days we play most often as The Bearcat Duo (thats Robin and Rowan), but love still playing as a full band too! Growing up with his parents’ sizable collection of folk and country records, Rowan gained a serious appreciation of traditionally based music in high school, first playing guitar but soon moving on to mandolin and banjo. Rowan models his mandolin playing on the style of Bill Monroe, favoring bluesy tone and rhythm. He has been honing his craft playing in the East Bay bluegrass scene, and until its recent closing had been hosting the historic 5th String bluegrass jam in Berkeley. 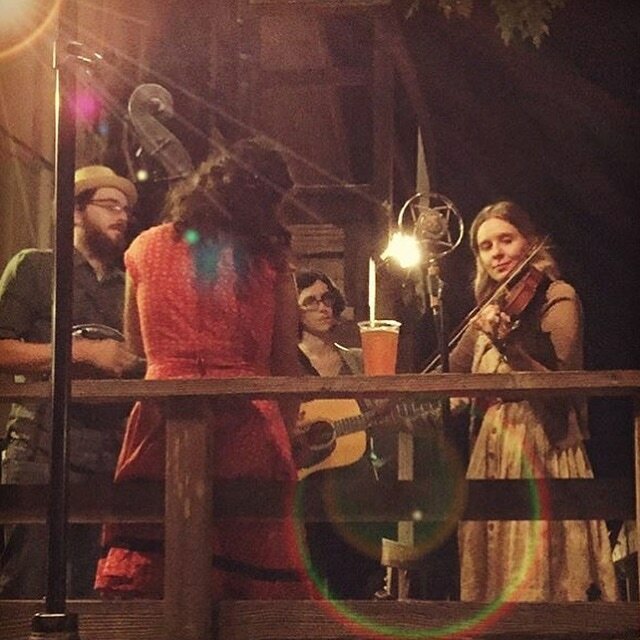 Rowan is availible for mandolin, guitar, and clawhammer banjo lessons in the East Bay. Allegra started out on the old-timey music path earlier than most. Daughter of local musicians Eric and Suzy Thompson, she was raised on a steady diet of American roots music, everything from Delta Blues to Appalachian fiddle tunes. The apple doesn’t fall far from the tree; Allegra has inherited both her parents’ love of traditional music as well as her mother’s powerful singing voice. High energy old time music with doses of bluegrass and old country.